On July 16, 1969, the United States’ Apollo 11 landed on the moon. How would people travel through space without spending most of their time sick? Deaf research participants would be key to finding the answers. Media has recently acknowledged G-11’s efforts, which for many decades went unrecognized. 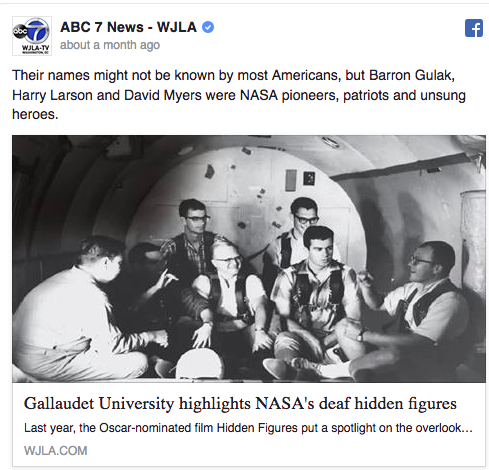 The Apollo 11 flight may never have been possible if it hadn’t been for the contributions of 11 Deaf men who were Gallaudet College (now University) alumni. From 1958-1968, and ending the year before men would land on the moon, 11 Deaf men volunteered to participate in a joint research program with the U.S. Naval School of Aviation Medicine and the National Aeronautics and Space Administration, or NASA, according to an article in Knowridge Science Report. Since they were Gallaudet alumni, they were called the Gallaudet Eleven, or G-11. All but one of G-11’s members had become deaf early in their lives due to spinal meningitis, which damaged their inner ears in a way that prevented them from getting motion sickness. 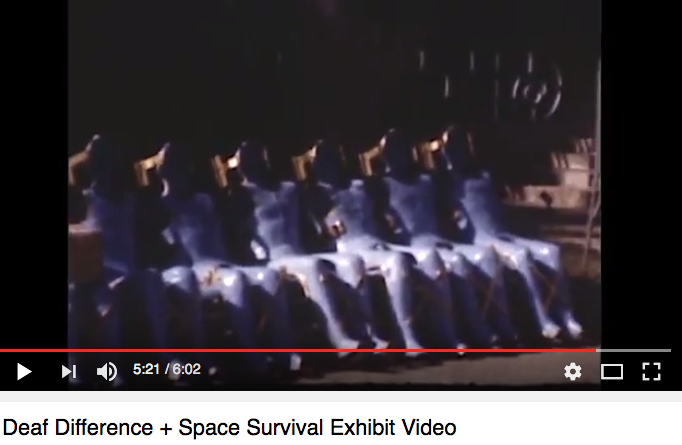 As far as space travel was concerned, motion sickness was a serious concern. G-11 members took part in a variety of activities, including flying in airplanes performing parabolic arcs that created weightlessness, rough seas experiments, spinning room experiments, and more. 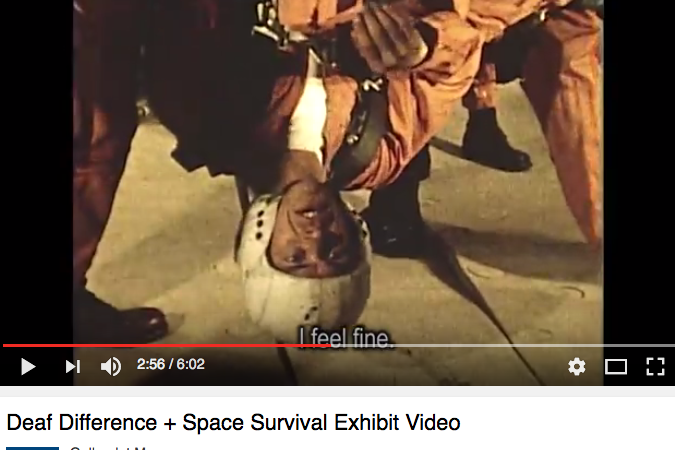 According to a NASA article, participants didn’t get sick. Researchers expected G-11 participants to not get sick, but they needed to understand how that happened. “The only discomfort was in the pullouts after steep dives when we experienced from 4 to 6 G—if you tried to lift your arms, they weighed a ton,” said G-11 participant Robert Greenmun. According to the G-11’s timeline, Greenmun never got sick, but had to nurse hearing Navy aides. Space wasn’t comfortable for people who could hear. Astronaut and Senator John Glenn said he envied the G-11 because he got motion sickness in space, but they didn’t. Even Earth’s Atlantic Ocean challenged hearing doctors, when Deaf volunteers didn’t get motion sickness on the rough ocean, but their doctors became sick and had to cancel the tests, according to the timeline. G-11 members enjoyed their participation and the challenges they faced. “We always looked forward to seeing new experiments. It was an adventure for us,” said G-11 participant Harry Larson. 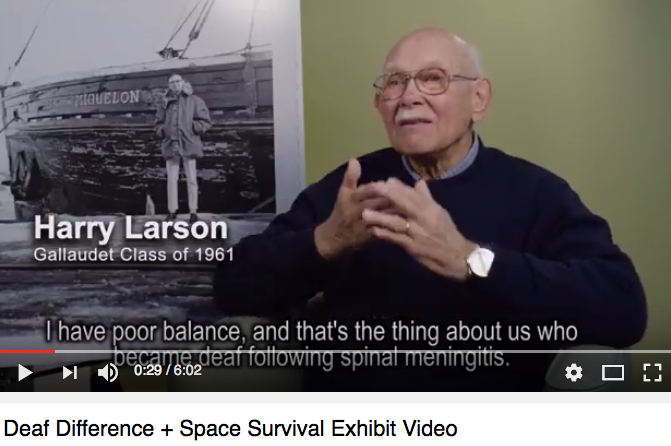 Larson had poor balance due to deafness from spinal meningitis, as did 9 other G-11 participants. The experiments helped improve the understanding of how our senses work normal cues for the ear aren’t there, as is the case with weightlessness, during gravitational forces, and at sea. “We were different in a way they needed,” said Harry Larson, one of the volunteer test subjects. Russia and the Untied States had competed to see which country would have a man set foot on the moon first. Since Russia’s second cosmonaut got sick during flight, G-11 may have contributed to the the American program’s ability to land people on the moon before its Russian competitor, according to the report. Today, only five of the 11 test subjects are still alive. 2018 will celebrate 60 years since the G-11’s historic contribution to the U.S. Space program. Some of G-11’s participants share their story in sign language. Three of the 11 former study participants attended the exhibit’s opening: Harry O. Larson, Gallaudet class of ’61, Barron Gulak, class of ’62, and David O. Myers, class of ’61. 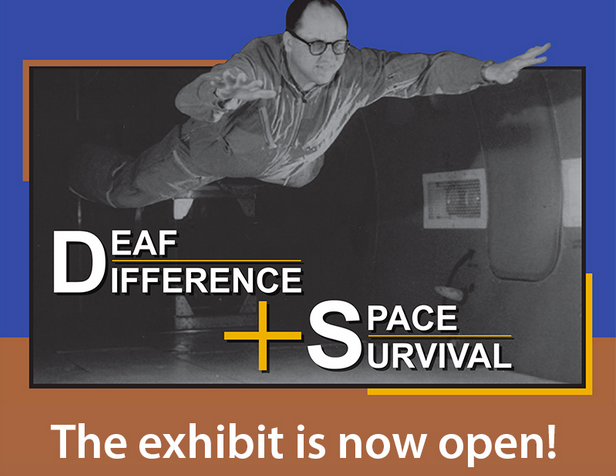 “Deaf Difference + Space Survival” is currently on display at Gallaudet University’s Jordan Student Academic Center, open Monday through Friday, 8:00 a.m. – 10:00 p.m.
See the open captioned and partial sign language video, “Deaf Difference + Space Survival” on YouTube.